Most of last week’s forex action was centered on developing Brexit news. The European Union decided to extend the UK’s leave date—originally scheduled for last Friday—until October 31st, which caused the Euro to increase in relative value by roughly 1%. The Pound had a week of ups and downs, though, without the Brexit extension, the downs probably would have been much worse. There are several important reports coming out this week—including job reports and inflation information—so Sterling’s volatility will likely remain above average. 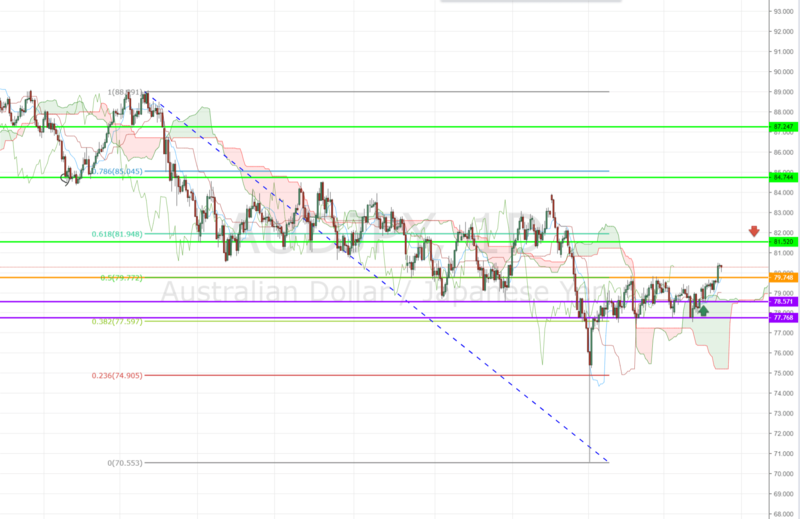 Following the release of some positive Australian and Chinese trade reports, the Australian Dollar was able to remain among the most productive currencies on the forex market. While the Japanese Yen did have a strong start to the week, most of its gains were reversed by week’s end. The AUD/JPY pair successfully broke above the daily Ichimoku Cloud as well as a key pivot level and the 50% Fibonacci retracement level of 79.74 at the end of last week. Though the pair kinda lost its momentum on Monday, doors still are open for the pair to reach the 81.52 resistance level. Both the United States Dollar and Canadian Dollar had somewhat uneventful weeks, which was likely caused by the fact most currency trading activity was taking place in Europe. With several important reports coming out of Canada this week, the Loonie is likely to be a bit more active. Following an excellent start to the month of April, Bitcoin prices have begun to stabilize, hovering just above $5,000 per coin. The coin’s peak value of $5,320 last Wednesday was significantly higher than the $4,095 price on March 31st. It looks like we are already off to another busy week in the crypto world. After Binance decided to delist Bitcoin SV—an offshoot of Bitcoin—its value immediately dropped by 9 percent. Tensions between Craig Wright and Changpeng Zhao will likely spark some reactionary trading action. In other news, the IMF and World Bank have decided to launch an “educational” blockchain token. While this token is designed for internal use, interest in blockchain from two of the world’s most important economic institutions is likely a positive sign for the industry as a whole. With tax season finally behind us, lawmakers in the United States are looking for clearer rules from the IRS regarding how crypto earnings need to be taxed. The IRS has not updated its guidelines in nearly five years, causing this particular concern to have unusually bipartisan support among lawmakers. After a somewhat stable week, the DOW finished last week strongly, jumping from just over 26,000 points to a peak of 26,411. At the same time, the S&P 500 experienced a similar increase in value and has been hovering around the 2,900 mark for the past few days. In preparation for its upcoming IPO, Uber announced that it plans to sell roughly $10 billion worth of stock. Though this figure is a bit less than what was originally expected, Lyft—Uber’s top competitor who recently went public—has witnessed its stock drop by more than 20 percent. This week has gotten off to a somewhat sluggish start, largely due to the fact that both Goldman Sachs and Citigroup released a somewhat disappointing earnings report. With several other major reports expected to be released by the end of this week, there will be a lot for traders to pay attention to. At the end of the trading day on Monday, index markets are looking generally bullish, but this could easily change by the end of the week. HIGH RISK Investment Trading forex (also known as foreign exchange or currencies) on margin carries a HIGH LEVEL OF RISK, and may not be suitable for all investors. Before deciding to trade foreign exchange you should carefully consider your investment objectives, level of experience, risk appetite, and the amount of your expendable income. The possibility exists that you could sustain a loss of some or all of your initial investment and therefore you should ONLY invest money that you can afford to lose! You should be aware of all the risks associated with foreign exchange trading, and seek advice from an independent financial advisor if you have any doubts. Forex Diva Trading Opinions Any opinions, news, research, analysis, prices, or other information contained on this website is provided as general market commentary and education, and does not constitute advice. Forex Diva will not accept liability for any loss or damage, including without limitation to, any loss of profit, which may arise directly or indirectly from use of or reliance on such information.